They Asked About the Map!!! "The Hartford not in park’s boundaries"
This is a followup to September 2008's post on the New Hartford Business Park. The picture on the left comes from the November, 1999, Final Environmental Impact Statement (FEIS) for the New Hartford Business Park. The picture in the middle was drawn last fall for "The Hartford" development, with "The Hartford" building and parking lot sitting in a projection to the right side of the photo (i.e., to the right of the area marked "Orchard" in the first photo). 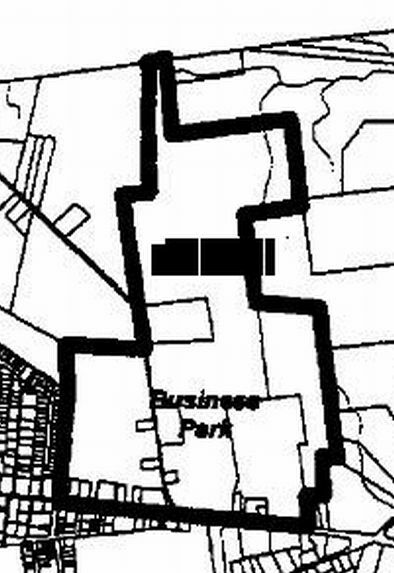 The third picture is from the Town Code §118-41.1, and shows that the official boundaries of the Business Park District are the same as those depicted in the FEIS. What this proves is that "The Hartford's" office building and parking lot are NOT within the boundaries of New Hartford's "Business Park District" and, therefore, should have been reviewed by the Planning Board irregardless of the "private panel" that the Observer-Dispatch now complains about. Either someone does not know how to read a map, or it did not matter what was on the map. 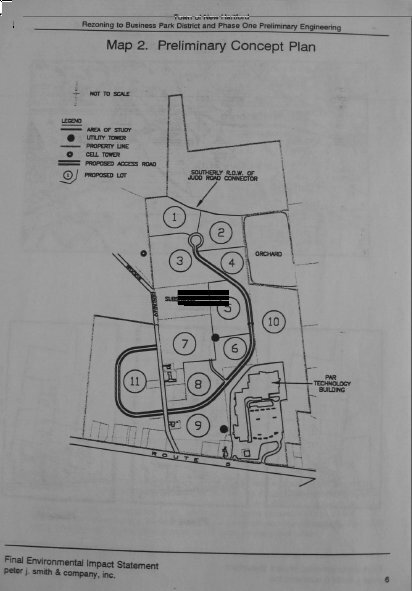 The letter from the Town Planner to Mr. Adler indicates that Town "Staff" reviewed his proposal and approved of it, including the location of the building. It is hard to believe that no one on Staff looked at the map, and that no one on Staff looked at the Environmental Impact Statement for the Business Park District. Either you have to accept the proposition that Town Staff is incompetent or lazy, OR THEY WERE INSTRUCTED WHAT TO DO. The impression is the latter, that like the pressure to get a light on Rt 840, this project was rushed through. Between what is posted here and what is posted on New Hartford Online Blog, there is more than enough material for either the Observer-Dispatch or the Utica Daily News to question Town Officials on what really went down, if either cares to do so. The logical starting points would be the Town Planner and the Town Engineer. 5PM Update: Looks like they've circled the wagons and are now closing the barn door (inviting public involvement) after the horse has been let out (approval of "the Hartford" office building)[sorry for mixing metaphors]. Members of the group, including Donovan, Town Planner Kurt Schwenzfeier and Town Engineer John Meagher, met Thursday morning, along with Town Supervisor Earle Reed to discuss the issue. . .
Schwenzfeier called the meeting “excellent and obviously necessary.” . . .“We have done nothing wrong in our current procedures,” he said. Reed said the town’s objectives had been honorable. . . . He noted that The Hartford, with its many well paid jobs, had been considering leaving New Hartford before deciding to locate at the business park. “If we had lost the Hartford, it would have been a terrible blow,” he said. A Terrible enough Blow to ignore the requirements of SEQRA? A Terrible enough Blow to ignore the fact that the office building and parking lot are OUTSIDE of the Business Park District -- and, therefore, subject to Planning Board Approval and not the Approval of the special committee? The O-D appears to be participating in a smokescreen . . .
YOU DIDN'T ASK ABOUT THE MAP, O-D . . . WHAT ABOUT THE MAP? The Price of Profit and Pride . . . Does anyone honestly believe that New Hartford — the largest town in the county with a population of 21,000 and the retail hub with a budget of $15 million — should be governed using the same model as the town of Ava, population 750? I don't know about Ava's "model," but a more apt comparison would be the "New Hartford" model -- circa 1990 -- when New Hartford had almost 1,000 more residents. How can fewer residents now require so much more government? The ready answer is that it is the price of New Hartford's recent "development" -- the price associated with being "the retail hub" for the region -- and the price of all the newer neighborhoods sprouting all over the hillsides. However, since the number of residents is declining, exactly who is benefiting from and who is driving the development? Some insights are offered by an article from Chris Leo, U. Winnipeg: "If Cities Can't Regulate Urban Growth, Urbanizing Municipalities Certainly Can't." "frequently lack the political will to resist the blandishments of developers, in practice, we are allowing the cost accounting of individual development companies to play a major role in determining the growth of cities. The question of whether the location and design of a new development responds to environmental concerns, and maximizes the city's ability to maintain the viability of its network of infrastructure and services, is unlikely to be high on an individual developer's list of concerns. The developer's responsibility is to shareholders, not the city as a whole." Mr. Leo goes on to explain that the situation is even worse in communities which are in the process of urbanizing, where numerous individual residents can make fortunes by subdividing farmland for development. The objectives of even the best intended plans get forgotten under pressures from those who hope to gain. This certainly describes New Hartford, where the objective of the business park district to create manufacturing sites (that was stated in the district's Environmental Impact Statement) was overlooked by the Planning Board (along with other things) when it gave Final Site Plan Approval to an office park instead. The Town has set its course in response to pressures exerted by those residents who would profit from Town actions, or who would seek to build monuments to themselves or their families. These persons pander to the pride of local officials when they tout, e.g., the Town's new status as "the regional retail hub" -- but that status has not helped the average Town resident, and, arguably, has adversely impacted the average resident's quality of life. These persons have insisted on growing New Hartford to be a competitor of Utica instead of being a bedroom community suburb of Utica. Eventually the Town will need what Utica has: a formal engineering department, a legal department, a professional fire department (with EMTs) and - of course - a courthouse -- all duplicative of what is already available in Utica just a couple miles away. Duplicating Utica won't improve things. More government won't improve things. These will only increase fixed costs so much that the entire region will become more non-competitive than it already is. New Hartfordians are going to have to decide just how much they are willing to pay for private profit and pride. O-D Hogwash in New Hartford . . .
Now we "find out" that a "Little-known panel OK'd the Hartford Building" in the privately owned New Hartford Business Park. A virtually unknown town committee approved the development and construction of The Hartford Financial Services building in recent years, in a process that skirted traditional Planning Board approvals. Who is the Observer-Dispatch kidding? What agenda is the O-D trying to advance? I can't say if there was or was not a "little-known panel" that "OK'd" things, but most certainly plans for the entire Business Park DID come before the Planning Board -- several times -- and were Approved. It's right there in the Planning Board minutes. Mr. Adler came before the Planning Board for a "Preliminary Site Plan Review" on March 27, 2006 and a lengthy discussion ensued. (scroll to p 4). The Planning Board was updated on June 12, 2006 (see p 5). On July 17, 2006 the Planning Board granted Preliminary Approval to the New Hartford Business Park (see pp 8-9). 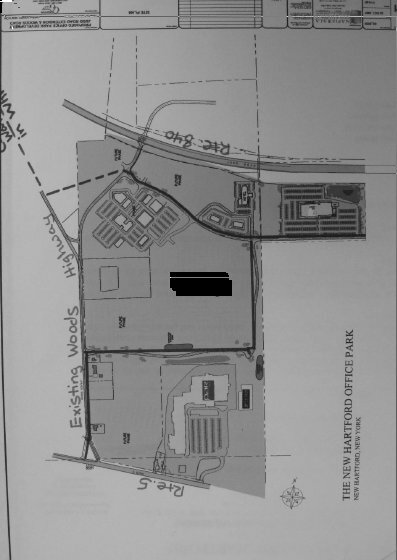 On September 11, 2006 Mr. Adler appeared for a "Final Site Plan Review" of the New Hartford Business Park, the Planning Board voted to "close SEQR," Preliminary Approval was given for Phase I of the project, and Final Approval was given for Phase I contingent on the developer providing an agreement for a future Town road (see pp 2-4). The Planning Board never looked at any site-specific plans, Donovan said. Really? Then what was the "Final Site Plan Review" and approval in the Planning Board Minutes all about? Does the Planning Board give final approval to plans it does not see? This would be laughable if it weren't so inexcusable. Of course, as this blogger previously pointed out, "The Hartford's" building is on a plot of land that was before the Planning Board in 2006 (see tax map ID ##s in the minutes), but NOT included in the original 1999 Environmental Impact Statement for the previously proposed business park district. The Planning Board, however, chose to rely on the 1999 EIS, oblivious to the change in footprint of the project (now extending outside the area considered for the business park district), and oblivious to several other changes from what was proposed in the EIS. Obviously, the paid Planning Board did not bother to read the Environmental Impact Statement even though it was their responsibility to ensure compliance with the State Environmental Quality Review Act. This was clearly a failure of the Planning Board on a massive scale. Technically, the building permits and the certificate of occupancy that were issued for this building, and all PILOTS and special arrangements for financing roads are void for non-compliance with the SEQRA -- but who would do anything about it? Private people aren't going to spend their money to make the Town follow the rules. The Planning Board Minutes are mysteriously silent about the workings of the "little known panel" . . . but the Planning Board clearly had responsibility under SEQRA. Now that irregularities are coming to the surface, the O-Ds "little known panel" is a convenient deflection of the Planning Board's failure.
. . . but Who you Know as the old saying goes . . . born out again this week in Daniel Labella's appointment to Police Chief by Mayor Roefaro. The mysterious dropping out of would-be competitors really isn't mysterious in local politics. People involved know what decision has been made long before it is publicly announced, so there is no point in fighting the inevitable. The only challange is to make the decision "legal." There were two different Civil Service Tests with different eligibility requirements. Usually eligibility requirements for a test are the eligibility requirements for the job. In Utica one has to be a Deputy Chief first before taking the City's test to become Chief, so how does one take a County exam without the eligibility requirement and qualify to become a City Police Chief? The two tests were different, the County test being shorter that the city test . So how is comparing the scores from two very different tests valid? If one is sick for a Civil Service test, its usually tough luck ... you take it the next time it is given. No so here . . . a special session was created for this County test for Mr. LaBella. For some people, this is the straw that breaks the camel's back. They are calling for the recall of Mayor Roefaro. More power to them! It's good to see the public, especially the unusually complacent Utica public, get motivated. . . . But the public should make sure that they are not merely treating the symptom of a bigger sickness. . . . or playing into the hands of others. Notice the County's involvement above. This particular appointment could not have occurred without County collusion. Keep your eye at the County level . . . The County preserves local fiefdom's powers. Maintaining the Status Quo . . .
An interesting article appears tonight on the O-D Website: Brindisi spent $17,000 on campaign for Utica school board. "The amount of money spent in the Utica race was higher than most school board races in the state, according to the New York State School Board’s Association. About 61 percent of school board members reported in a 2008 survey that they spent no money in their last campaign, and just 4.1 percent reported spending more than $1,000. But it’s not unusual for Utica school board candidates, who regularly spend far more than average for mailings, signs and media ads to win the five-year seats. Brindisi’s list of contributors reads like a who’s who list of Mohawk Valley officials and also includes three current Utica school board members — Margaret Buckley, Barbara Klein and Chris Salatino. Also contributing were newly sworn-in Utica Police Chief Daniel LaBella, U.S. Rep. Michael Arcuri, D-Utica, State Sen. Joseph Griffo, R-Rome, and New Hartford’s new budget director Heather Mowat. “When I announced my candidacy, friends and family came forward with overwhelming support,” Brindisi said. "Family and friends," my eye! The same old - same old names are behind the election. The area's "elite" take care of their own, regardless of party affiliation, to ensure that they remain "in charge" of one of the biggest pots of public money in the region. What good have they accomplished? ... other than for themselves? What's the Fix for Upstate? Our little part of the country would seem to have everything going for it. We are blessed with a beautiful countryside of fields, forests, mountains, valleys, lakes and streams – abundant with water, wildlife, and other natural resources – and capable of nourishing people, agriculture and industry. Our climate rarely produces the hurricanes, tornadoes, forest fires, floods, and earthquakes that seem to plague and harm people elsewhere. Anchored to the world port of New York City, and strategically positioned on the favored route to the West, Upstate's natural assets only needed the leverage provided by the Erie Canal to become productive. Following the canal, people came and found things to do, supported by the canal's ability to inexpensively transport raw materials and finished products to where they had to go. Fruit, vegetable, and dairy farms flourished in the fertile landscape. Readily available hydropower turned wheels in mills where all sorts of products were manufactured. Jobs became plentiful, and the population increased. Cities grew along the canal like pearls on a string, becoming centers of wealth, culture, commerce, and education. The Erie Canal, and Upstate's growth, in turn, spurred more growth in New York City, turning it into the world's financial capital. Although the canal declined in importance following construction of the railroads, Upstate continued to grow and do well because its long-established institutions and infrastructure provided amenities not available in many other places. Even our own Greater Utica area was growing at such a rate that there were fears that our natural resources, especially water, would be unable to sustain the growth. In 1968 Oneida and Herkimer Counties, with the New York State Department of Health, commissioned a study of all of the water resources in the counties and planned how those resources should be developed and distributed to serve a population expected to grow from the then-approximately 335,000 to about 568,000 in 1990 to well over 700,000 by 2020. However, our population did not grow. The trend reversed, and our two counties have lost population, now holding less than 300,000. This change was not confined to our area. Like elms succumbing to the dutch-elm disease, other Upstate areas also became economically sick, with declining populations, businesses and jobs leaving, taxes increasing, and, incongruously, development taking up more acreage, replacing farms and orchards. Now, for businesses to come into the region, we feel obliged to bribe them with various taxpayer subsidies. Our natural and man-made assets no longer are attractive. Why? Examination of what happened to two of Upstate's biggest assets, cheap transportation and cheap hydropower, suggests the source of our problem. The canal was superseded by the railroad, and the railroad by the Interstate Highway System. Other places had railroads and interstates, too, so Upstate lost its transportation advantage. But New York State's maintenance of a toll on the Thruway, Upstate's principal east-west commerce artery, placed Upstate at a distinct disadvantage, when compared to other parts of the country. Considering that the federal government paid New York a large sum of money in the late 1980s to make up for the state having used its own money to construct the Thruway, and considering that the bonds used to finance the Thruway were paid off in 1996, there was no need for the toll to remain, but it did. To add insult to injury, the legislature turned maintenance of Interstate 84, a toll-free Downstate highway, over to the Thruway Authority, and removed tolls from Downstate portions of the Thruway including the New England section, burdening Upstaters, through their tolls, to pay to maintain several free Downstate highways. This smacks of the colonialism that existed between America and England in the 1700's which led to the Revolution. Clearly, a different standard is being applied to Upstate, and state government has turned Upstate's transportation advantage into a disadvantage. Although hydropower (which is cheap) is abundant in Upstate New York, Upstate still has some of the highest electric rates in the nation. This is because the power is being shared with Downstate. The NYRI power line would have made it even easier to send more power from Upstate to Downstate and was expected to increase Upstate rates further. Although we are fortunate that this proposal has been taken off the table, the New York Power Authority is proposing a line under the Hudson that will do essentially the same thing. Meanwhile, Downstate shut down the Shoreham, Long Island nuclear power plant before it even became productive, hopes to do away with its Indian Point nuclear power plant, and is planning on doing away with its coal-fired generation plants. New York State now wants a significant percentage of power to come from renewable sources, which includes hydro. Essentially, Upstate will become New York City's power generation station. Again, a different standard is being applied to Upstate, and state government has again turned an Upstate advantage into a disadvantage. Cheap transportation and cheap power, both essential to Upstate's manufacturing economy, have been done away with to satisfy preferences of people living in a part of the state where the economy does not depend on them. The Upstate perspective in state policy-making has been lost. When and how did this happen, because up until the 1960s both parts of the state had worked together and were doing well? The change may be traced to the reapportionment of the New York State Legislature. Prior to the mid-60s the State Senate was usually controlled by Upstate, and the Assembly was controlled by Downstate. This was the case regardless of which party controlled which house or the Governorship. For anything to get done, Upstate and Downstate were forced to work together, to accommodate each other, and to look out for each other's interests. They did -- and a symbiotic relationship developed that worked incredibly well for over 150 years, turning New York State into the Empire State, the most populous, powerful, and wealthiest state in the nation. Then came the US Supreme Court decision in WMCA, Inc. v Lomenzo, 377 US 633 (1964), which held that the NY Constitution's apportionment scheme (which ensured that Upstate's perspective would be heard) violated the 14th Amendment of the US Constitution's “equal protection” clause - the Court equating "one man - one vote" with "equal protection." The reapportionment of the state legislature that followed gave Downstate control of both houses. Upstate, and, to a lesser extent, New York State as a whole, have declined in importance ever since. The Court's decision was split 7-3. As the Dissent pointed out, there may be good reasons for a state to ensure that particular geographic areas have a voice, and it is a violation of State Sovereignty for the US Supreme Court to second guess the reasons why a particular arrangement was chosen. I happen to believe that New York's Founding Fathers over 200 years ago knew what they were doing, which was not unlike what the country's Founding Fathers were doing when they gave every State two senators regardless of population. We need to renew an appreciation for their wisdom in designing a Senate based on geography and an Assembly based on population. Then we need to get the Supreme Court to revisit its old decision. Perhaps with the "new evidence" represented by Upstate's 40-year decline following reapportionment, the outcome will be different. . . the symbiotic relationship between Upstate and Downstate will be restored, and New York will rise again as one state -- the Empire State. The OD Says: Bill to make mergers easier deserves OK. But is this the bill that we really need? Readers of this blog know that I advocate the creation of "The Municipality of Greater Utica" to consist of the City of Utica; Towns of New Hartford, Whitestown, Marcy, and Deerfield; Villages of Yorkville, New York Mills, Whitesboro, New Hartford, and Oriskany; the Mohawk Valley Water Authority; the Oneida County Part-County Sewer District; and various other "Utica-centric" authorities; plus portions of other jurisdictions that are served by either the Water Authority or the Sewer District. While cutting costs is the selling point for some, for me the true issue is giving the People who would live in this Municipality meaningful control over what local government accomplishes in their everyday life. We have all witnessed the ravages of "sprawl." I think most people would prefer to have "city" activities in the city and "suburban" activities in the suburbs. Bulldozing apple orchards for business parks while large portions of downtown are vacant makes no sense. However our "Balkanzed" local governments make that happen: people in New Hartford have no say over how Utica develops, and vice-versa. Our Water Authority extending lines ever outward just to grow its business while creating a water shortage that will make it difficult to reindustrialize old sites also makes no sense -- but it happens because selling water was divorced from other municipal responsibilities. Ditto for the Part-County Sewer District, only with the District, control has been handed over to people half of whom live outside the District. Water and Sewer are our biggest pieces of shared infrastructure. They determine where development occurs. Unless We the People govern them as one municipal entity, they will control us, playing one part of us against the other, and they will eat us alive with a half-billion in expenses. Andrew Cuomo certainly deserves a round of applause for bringing the matter of streamling consolidation forward. The idea of giving the People the right to initiate the process is especially intriguing. (Where is the "Initiative, Referendum and Recall" we were promised so long ago like they have in California?) Would Mr. Cuomo's Bill permit "Greater Utica" to emerge? Download the bill from the Attorney General's website. The proposed law is all about consolidating "local government entities." The key is in the definition of "Local Government Entity." There you have it . . . no help whatsoever with the type of consolidation that we really need here. I've previously blogged about Upstate suffering because policies are implemented from a Downstate perspective. My suspicion is that this bill was written from a Downstate perspective, where the Towns are all highly populated and various services have already been extended throughout. Upstate is different. Many Towns have sparsely populated areas -- areas where population density is too low to support services. Consolidation in such places, if not carefully done, could require village residents to subsidize services to outlying areas, increasing taxes, fees and rates, and result in more sprawl. Alternatively, it could also result in a loss of services within villages, if the combined town-village population density is too low to support services everywhere. The bill should probably be passed because anything that gives more power to the People is a good thing in New York. It is also a good start on consolidation . . . but it does not go far enough to meet our own local needs. WOW! The headline suggested Utica may be coming back. Then I read the story . . .
"The construction of a six-story, roughly $10 million downtown apartment building is among a series of ambitious projects the Utica Municipal Housing Authority plans to undertake soon, officials from the agency said.. . . "
Another government-paid-for project! That's sort of like buying self-esteem, isn't it? The city cannot get private investors to do this, so it gets the taxpayers to do it instead. Oh, I know, these are Federal Dollars rather than local, but we pay for them anyway. "It would include both subsidized and market rate apartments." That sounds like public housing! The city just spent millions to bulldoze (rather than renovate) another public housing project, Washington Courts, only a few blocks away . . . Now it wants to build more public housing? I would like to think that city officials learned a lesson from what they already did: that doing away with Washington Courts killed the market for a downtown drug store which everyone now misses. . . But somehow I don't think that even played a role. "The building would be built on top of the Kennedy parking garage near City Hall." Now THAT REALLY got my attention. Maybe my memory is failing (so someone please correct me if I'm wrong), but weren't we told during the last administration at about the time that Utica National was looking to locate some offices Downtown that the Kennedy Parking Garage could not support a structure on top? I remember that it was designed back in the 1960s to support an office tower -- a six story tower at that. I thought we were told that the existing structure had deteriorated over the years and could no longer support a tower? Anyway, assuming the structure is sound, why the change in use from office to apartments? There is a huge municipal housing development already there, right next door. It seems to be too much of one use in the same location. Also, how many people would want to actually LIVE RIGHT ON THE City Hall Plaza where numerous public events are held? I might enjoy the symphony from my balcony, but I wouldn't want to be subjected to heavy metal if I want to go to bed early. The original intent was for an office building, and that would seem to be the best use for the site. But, of course, there would be no Federal Dollars for an office structure, now would there? So I guess area residents will just have to put up with a misplaced use that will detract from, rather than enhance, both the City Hall Plaza and the residential structure itself. Where is the Master Plan in all this nonsense, anyway? To me, this is just more of the Same Old, Same Old around here -- a grab at some Federal Money -- which will make some individuals rich . . . but saddle the public with something that is not going to work very well. We learned this past week that Mr. Griffo is coveting Congressman McHugh's seat now that McHugh is being appointed to a position in the Obama administration. Is anyone taking bets that Mr. Picente plans to be appointed State Senator? Getting Back up to Speed . . . I took a break from blogging for a few days to write an article for the upcoming Utica Phoenix. . . . When it is in the news rack (expected in a few days), I will post last month's article here. . . .
Be sure to get the Phoenix for the latest on an important issue.